← iOS Game News: Jelly Defense Out With Winter Levels! Youda Survivor may remind you of the Farm Frenzy series, but on its own, it is a refreshing time management (TM) title with a touch of RPG that offers a bit more depth and strategy than your garden variety TM game. You find yourself stranded on a strange island where the people think you’re some kind of god. Now, this storyline is a bit too familiar, especially when it comes to building simulation/TM games. This time, you’re magical Youda – bringer of rain, harbinger of harvests and plenty. But, since you’re not a god nor magical, you need your strength and energy to do wonders. This clever twist makes the gameplay of Youda Survivor HD an interesting, challenging and strategy-laden TM game. Youda Survivor HD is a delightful mix of strategy and resource management. The basic gameplay is very similar to the Farm Frenzy formula (read the review of Farm Frenzy 2: Pizza Party HD to get an idea of what I’m talking about). You have different “stations” with machines that produce certain goods, and in most cases these goods serve as building blocks to form more complex things. Unlike in Farm Frenzy which relies on money, your currency here is energy. You need energy to use and upgrade machines, summon spells, and fight off the occasional pirate visitors and crabs (the FF equivalent are the different kinds of bears that you need to keep in cages or drive away) who are out to get you and your animals. The energy aspect is what sets Youda apart from Farm Frenzy – to earn enough energy, you have to ask your resident chef to boil up some potions (from your goods) to supply you with energy. The strategy involved requires making some tough decisions. Say you need to earn 1,000 energy and you need to produce as much goods as you can to make enough. You have to consider, however, that you get more goods at the soonest possible time by upgrading your machines, which also require energy. Thus, there comes a point where you need to choose between upgrading your machine to produce and process more goods and as a result, more energy – or if you want to focus on meeting the 1,000 goal first even if it takes you longer to do so. At the same time, the RPG element lets you customize and upgrade your skills and equipment with the gold you earn after completing each level. This also makes the game even more interesting as you have to choose between which upgrade to prioritize. 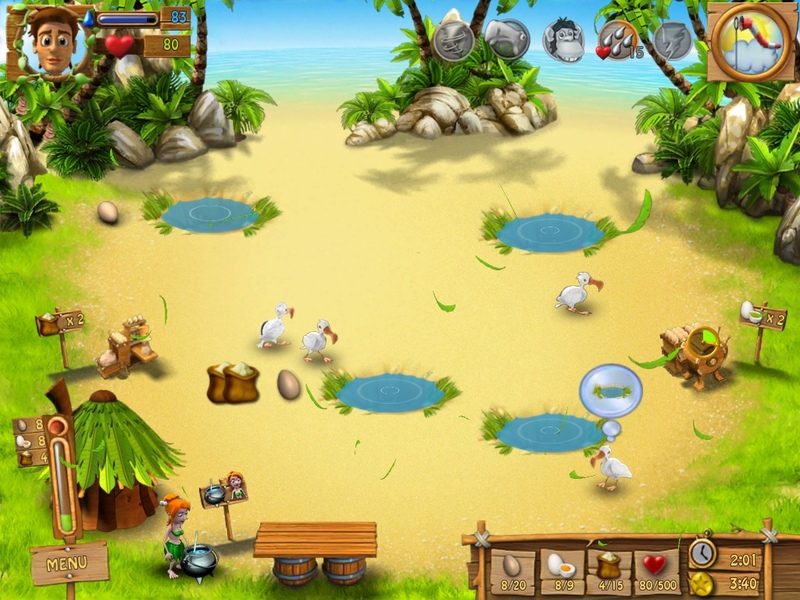 The graphics are simply gorgeous and each scene is very colorful and vibrant. The music and effects are also just as pleasant and interesting but not that memorable. The fighting off pirates animation is also well done and even exciting at times. There are also some mini-games in between to break the monotony. As a TM aficionado, I must admit that Youda Survivor HD is pretty unique, even if it shares some of the gameplay popularized by Farm Frenzy. It’s an effortless recommendation to anyone who loves time management games or who wants to try out anew and interesting title.